Placards reading 'we demand a people's vote' are seen as demonstrators protest outside the Houses of Parliament. Lara Spirit, co-founder of Our Future, Our Choice, who campaign for a second referendum, admitted it could be "problematic" but that it was the only "sane" option left. Prime Minister Theresa May suffered a huge defeat on her Brexit deal on Tuesday night, as she lost the “meaningful” vote by a majority of 230. Ms Spirit told talkRADIO’s Mike Graham: “I think [Brexiteers] are right to reject the idea that we would say that nobody knew what they were voting for,” she said. "I think that is ridiculous and we have certainly never said that. What I would say is that a lot of those voters would not be happy with Theresa May’s deal either and many of them are seriously angry with that. “I don’t think a People’s Vote is anything which many people are going to be extremely happy with and will think that is going to be an uncomplicated, unproblematic thing. “Of course it is massively problematic but I don’t think it is our fault for campaigning for it, I think it is the fault of politicians who have failed to get a deal through. Ms Spirit said that the March deadline for leaving the European Union was “propelling some politicians” into action. “We have the March deadline, which is luckily propelling some politicians into finally being responsible,” she said. She added: “I think campaigns such as ours definitely have a lot of momentum at the moment. I don’t think that is necessarily because Leave Means Leave aren’t loud – or other groups aren’t loud – I think it is because options are thinning. 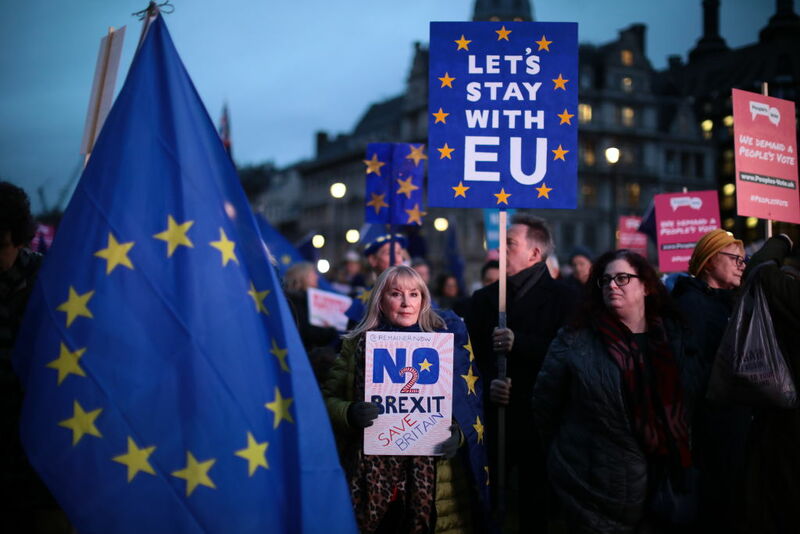 Anti-Brexit protesters outside the Houses of Parliament as Theresa May was defeated in the House of Commons. Ms Spirit added that a People's Vote is the "only sane option left on the table". “There is a serious possibility that a People’s Vote is going to happen," she said. "I personally think it is the only sane option left on the table. It is the only option that is going to deliver for this country and take us out of this mess appropriately. “But if it becomes a situation whereby we had a People’s Vote and people voted to leave again, I would accept that.